The May decision of the Illinois Supreme Court, which held that pensions for current government employees can’t be modified, has shifted the public’s focus away from the biggest driver of Illinois’ fiscal crisis. Illinoisans turned their attention away from the state’s ailing government-worker pensions toward Illinois’ nearly four-month-long budget impasse and the state’s inability to pay its bills. Illinois has been operating without a budget since July 1, 2015, as Gov. Bruce Rauner battles the Democratic-controlled General Assembly over economic and spending reforms needed to turn Illinois around. But Illinois’ pension crisis reared its ugly head again when Illinois Comptroller Leslie Munger announced Oct. 14 the state cash-flow crunch is affecting Illinois’ ability to meet its government-worker pension obligations. Munger said the state would likely delay its November $560 million contribution to the state’s government-worker pension funds. She also said the state might delay its December pension payment as well. That’s not good news for Illinois, which has more than $111 billion in government-worker pension debt. In fact, Bloomberg recently reported that Illinois continues to have the nation’s worst-funded government-worker pensions, despite widespread improvements in other states’ public pension funds since 2013. More than two-thirds of U.S. pensions had increased funding levels in 2014, according to Bloomberg. The median funding ratio for pension funds in all 50 states is 70 percent. Unfortunately, Illinois pensions are funded at just 40 percent, the lowest level in the nation. Given the worsening funded ratio for Illinois’ government-worker pensions, one would think Illinois is underfunding these pension plans. But the amount of taxpayer funds going into Illinois’ government-worker pensions keeps rising. In 2005, the state’s combined annual contribution to its five state-run government-worker funds was $1.7 billion. In fiscal year 2015, the amount jumped to $6.9 billion, quadruple the 2005 amount. When payments for pension obligation bonds are included, pension costs now consume more than 25 percent of the state’s general-fund budget, up from 8 percent in fiscal year 2005. Illinois’ government-worker pension-fund payments are crowding out funding for education, health care and infrastructure; this will only grow worse as pensions eat up more and more of the state’s budget. State funding for education provides a worrisome example of this crowding-out. Pension costs now consume so much of Illinois’ education budget that the pension contribution to downstate and suburban teacher pensions – the largest of the five state government-worker pension systems – is set to outstrip the amount of state aid for classrooms. 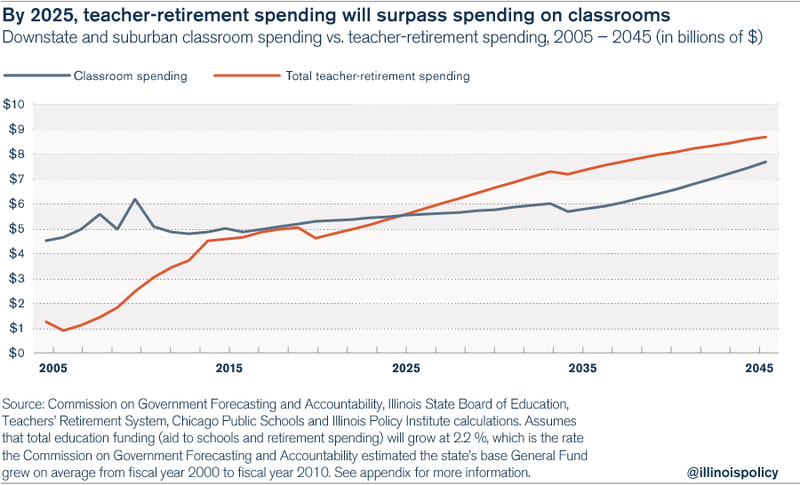 Without reforms, teacher-retirement spending will surpass spending on classrooms by 2025. In fact, by 2014, the state had added $8.9 billion in new dollars over and above the base amount of $6.8 billion it spent in 2009 on education. 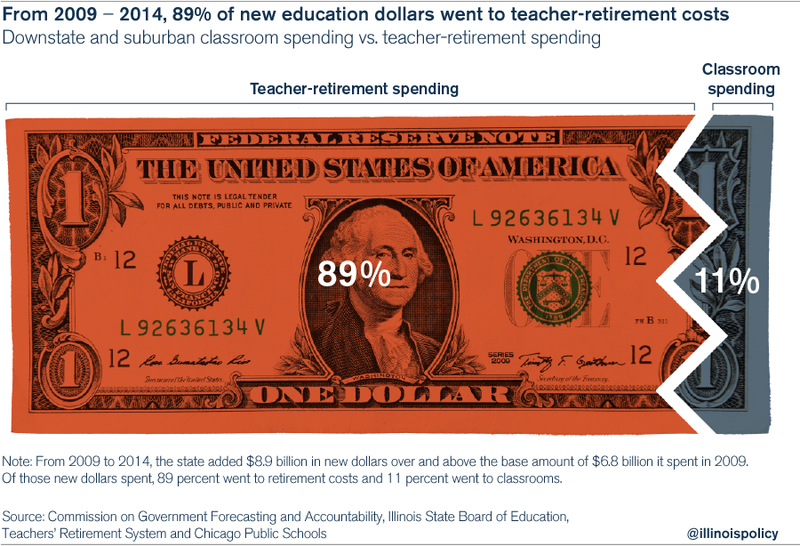 Of those new dollars spent, 89 percent went to pay for teacher-retirement costs. Just 11 percent made it to the classroom. Illinois must confront its government-worker pension crisis or it will be forced to divert funds from other core government functions. Fortunately, even in the absence of comprehensive pension reform, there are seven things Illinois can do now to reduce the impact of the pension crisis.